Accolade Model 1 review | What Hi-Fi? Never heard of Accolade Audio? It’s a new brand, part of the Arcaydis group, sitting alongside the well-regarded (but online only) EB Acoustics brand. Never heard of Accolade Audio? It’s a new company, part of the Arcaydis group, sitting alongside the well-regarded (but online only) EB Acoustics brand. to the partnering 10cm paper coned bass driver at 720Hz as opposed to the 2.5-3.5 kHz crossover point found in most rivals. in similarly priced rivals. Listen to Adele’s 21 and it’s hard not to be deeply impressed by the Accolade’s articulate nature or the impressive degree of clarity on offer. There’s also plenty of resolution on tap, and a pleasing ability to unravel musical strands in a complex piece such as Stravinsky’s The Rite of Spring with ease. The Model 1s are small, standing just 30cm high, so deep bass is off the menu. and the conventional bass driver below it, which sounds relatively soft and laid-back. In many ways the Model 1s are terrifically capable. They’re just not quite all-rounders, so audition carefully before buying. The technology highlight of the Accolade Model 1 is that the company uses BMR (Balanced Mode Radiator) drive units, which allows its drivers to cover a much wider frequency band than traditional alternatives. In fact, the 64mm BMR in the Model 1 crosses over to the partnering 10cm paper coned bass driver at 720Hz as opposed to the 2.5-3.5 kHz crossover point found in most rivals. This engineering difference makes itself felt with vocals: there’s a precision from the midrange upwards that’s hard to find in similarly priced rivals. Listen to Adele’s 21 and it’s hard not to be deeply impressed by the Accolade’s articulate nature or the impressive degree of clarity on offer. There’s also plenty of resolution on tap, and a pleasing ability to unravel musical strands in a complex piece such as Stravinsky’s The Rite of Spring with ease. The Model 1s are small, standing just 30cm high, so deep bass is off the menu. In our test room they sound best close to, though not right against, a rear wall. This placement gives the rear-ported design’s low-frequencies just a little (needed) reinforcement. 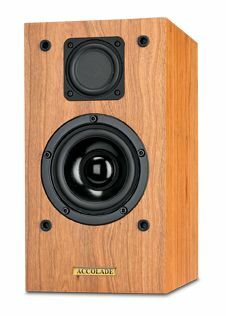 Set-up properly, the Model 1’s soundstaging is impressively broad, and stays stable over a wide range of listening positions. Criticisms? The treble performance isn’t great. For all the insight on offer, it sounds a little too unrefined, hard and monotonal for our tastes. There’s also a notable variation in character between the BMR driver, which sounds massively taut, and the conventional bass driver below it, which sounds relatively soft and laid-back.